As a marketing professional, you know it's vital to have long-term vision and see the big picture. To do that, you must always plan ahead. Let me help you with a little prodding about who should be thinking inflatables right now and why. Football Teams - High school, college or pro. Why? Because you need to order inflatable sports tunnels early in order to get them back before your season starts. Begin thinking about what shape and colors you want to include in your tunnel and get the necessary approvals so you can place your order by early June. Need help with funding? Contact us for information on how your sports tunnel can actually pay for itself. Product/Service Promoters - If you have summer events scheduled, now's the time to start the process of creating your inflatables. Trade Show Exhibitors - Planning to attend one of these (or other) popular trade shows in the next few months? That doesn't leave much time. Contact us today to place your order. Did you attend ASI in Las Vegas this month? We're now members of ASI/66233 and would love to hear from you if you were at the show. Think inflatables are strictly inanimate objects? Certainly not! I'll show you when and how you can bring your inflatable costumes to life. As always, I've also got some idea-generating case studies for you. What have I been doing in my spare time? I've been glaming it up a bit with some new headshots from photographer Amy Zellmer. I've also been working furiously to improve the user friendliness of our website. Take a peek at the new Inflatables by Market and Inflatables by Usage sections of the site. What an improvement! The bell of the ball for sure, "Mardi" made her debut at the 2008 Mardi Gras on Main Street parade in DeLand, Florida. Sponsored yearly by Krewe of Amalee, this event features parade floats, dogs and people all dressed in festive Mardi Gras attire. They swing. They sway. They walk up and hug you! Most people are familiar with cold-air inflatables that are tethered to the ground. Many are also familiar with newer dynamic inflatables that are still tethered, but can flap and wiggle in the wind. Making their way up on the popularity list are inflatable costumes. What's the difference? Inflatable costumes let your character move around freely wherever he wants. Case studies seem to be all the rage these days. And no wonder! They give excellent inspiration for creative ideas, they prove whether a product or service really works and they make for all around good reading. I guess that's why Landmarketing keeps dishing them up issue after issue. (We have 4 for you today!) To keep the stockpile full, we need your help. If you own a Landmark Creations inflatable and have a success story to tell, we encourage you to submit your details and photos on our site. There are 9 simple questions to complete and 2 options for sending your photos or video. That's it! Yours may be one of the companies featured in an upcoming issue of Landmarketing! Also, if your business markets with inflatables, sells or rents them, you'll want to pay close attention to our Feature Article that points out major differences in professional inflatables and yard inflatables. The Environmental Protection Agency's (EPA) Office of Water recently engaged in some heavy event marketing as they celebrated National Drinking Water Week. The festivities were designed to educate children and adults on issues related to the safety of drinking water as well as gain media attention for the EPA. To make the event fun, marketing materials such as multimedia games, on-site computers and more were provided for attendees. In addition, EPA staff volunteered to speak on a variety of topics related to water safety and cleanliness. The EPA's marketing agency, The Track Group, also turned to Landmark Creations to develop a mascot that would appeal to kids and adults. As a sporting goods manufacturer of baseball, softball, volleyball, golf, and running equipment and apparel in the United States, Mizuno was looking for a way to improve brand recognition. Using an inflatable arch during their footwear and apparel sponsorship at the ING Georgia Marathon and Half Marathon in Atlanta, GA provided an excellent opportunity. Since its debut in 2004, the Lincoln Kids Triathlon "Splash, Mash and Dash" has been a big hit with kids and parents. Created to get kids moving, the June 30th race included swimming, bicycle riding and running as its three events. Marketing / advertising opportunities were offered to sponsors to help offset costs. Race Director, Karen Lewis reported, “This year we will have an inflatable arch which we can use to promote our major sponsors of the race. Boosting team spirit and having loads of fun are always the goals when schools approach Landmark Creations to produce custom sports tunnels. That's because, time after time, and team after team, these creative sports inflatables drive crowds crazy. With the introduction several years ago of yard inflatables, we've seen our share of questions about the differences in what we offer and what can be bought at a local Wal-Mart store. In an effort to clear up some confusion, we've created a comparison that will help you determine which is the right option for you. 'Tis the season! Halloween has come and gone and we're fast approaching the official launch of Holiday Season 2006 and it's slated to be B - I - G! In fact, US online retail sales this holiday season will reach $27 billion, a 23 percent increase over last year, according to Forrester Research. Are you ready to get your slice of that pie? If you haven't done so already, it's time to pull those inflatables out and give them a good going over. Check for anything that might need repairing. Also consider the size of your inflatables inventory. Do you have enough to cover trade shows, storefronts for all locations, parades, special events and the like? If not, you'll want to act quickly. Are you using helium inflatables during this busy season? If so, be sure to read this issue's feature article for excellent tips. I'll also give you the scoop on the new 2007 Landmark calendars plus invite you to test your turkey shooting skills playing Lurkey In The Straw: A Thanksgiving Day Turkey Shoot. You don't see helium-filled inflatables used outdoors as frequently in the wintertime. That's because helium behaves differently as the weather turns cold. When the temperature falls helium contracts making it difficult (but not impossible) to use. If you need your helium inflatables for parades or for indoor fairs or exhibits patience is going to be the key. Here are some tips that will help you remain afloat. The Hotter 'N Hell bicycle race was originally created in 1982 by the Wichita Falls Bicycle Club as a way to celebrate Wichita Falls' 100-year anniversary. It is now the largest single day 100-mile bicycle ride in the nation attracting over 10,000 racers from all across the globe. In celebration of their 25th anniversary, the club wanted to do something truly spectacular for this year's race. That's why they teamed up with Landmark Creations, designer of inflatable mascots, arches and more. Years ago, Valero Energy Corporation (owners of Beacon and Ultramar Diamond Shamrock gas stations) began participating as a charitable sponsor of PGA Tournaments. In order to increase exposure of these worthwhile efforts Valero commissioned Landmark Creations to develop an inflatable advertising piece for them in the shape of a golf bag. This cold air balloon stood 20-feet high and bore the Valero logo as well as the name of the tournament: The Valero Texas Open. It is during this tournament that the Benefit for Children Golf Classic is also held. Welcome to Landmarketing Issue 24 - Inflatable Marketing Ideas You Can Use! With the holidays over, it seems life is starting to take a turn toward the quasi-normal again. If Santa left a little something in your marketing stocking, now's the time to think about how to best invest those funds. Are you in an industry that should be promoting heavily with inflatables right now? Tax Preparation - Get the attention of those in a hurry for your services. With competition from freelance tax preparers and do-it-yourself software packages, you'll want a way of making a lasting impression. Inflatables deliver! Financial Services - For those who extended themselves a bit too much over the holidays, loans and other financial offerings will be welcome. Put your best foot forward with custom inflatables from Landmark. Trade Show Marketers - Spring is coming and thoughts are moving toward boating, home renovations, landscaping and other outdoor activities. If you're promoting a trade show or exhibiting at one, let Landmark show you how to increase your foot traffic. Talk about giant inflatable advertising! This was one for the books for sure. When Royal Caribbean Cruise Line announced their ship, Voyager of the Seas, would call Galveston, Texas home, there was quite the buzz. Taking the teen crowd by storm, Miley Cyrus (aka Hannah Montana) needed a way to organize all those fans at each event. As kids and parents gathered - sometimes hours before each show - they could look for the Miley's World inflatable advertising balloon to direct them to merchandise sales and special offerings. O'Reilly Battery is one of the largest specialty retailers of automotive aftermarket parts, tools, supplies, equipment and accessories in the U.S. Serving do-it-yourselfers as well as pros, they needed a creative way to rise above traditional branding methods. After all, when one of your brand names is SuperStart, you need a super way to promote products. Look! It's a bird. It's a plane. No… it really is a bird. At least part of one! Onlookers at the Macy's Day Parade in Times Square got quite a shock when they noticed poor Tweety had flown south… right into a billboard. Fage Yogurt along with Atomic Props concocted this eye-catching inflatable billboard that demonstrates just how thick Fage yogurt products really are. If you've been around inflatables for long at all, you know cold-air and sealed inflatables need some apparatus to hold them upright. Because of their height and other physical attributes, these types of inflatables require stabilization. Wow! What a jam-packed issue we have today! Because of all your great feedback from the survey, we've made a couple of changes. The most significant is to give you even more case studies. While most people said they read the newsletter from beginning to end (thanks! ), case studies were obviously one of the favorite features. Do you have a Landmark Creations inflatable you want to highlight? Give us all the details and you might be included in a future edition of Landmarketing. We also need your input on a different matter of great importance - computer games. You'll find detail in the Fun Stuff section. In this issue you’ll find five (count 'em… five!) case studies plus an insightful checklist to use when choosing an inflatables vendor. And… drum roll please… we'll announce the winner of the iPod Shuffle! First, thanks to all who took a few minutes to answer our survey about improving Landmarketing. We promised to give away an iPod Shuffle and we have made good on our word. Congratulations to Richard Barrett. Richard's response? Very nice! I think that is the second thing I've won in my 61 years. Maybe he's on a roll now. You'll know Richard when you see him because he'll be the one shuffling along bobbing his head with a spring in his step. Happy humming! Ah! Summer! Also known as "Inflatable Season." With more people outdoors during summertime, it only makes sense to ramp up your outdoor promotions. That means using your existing inflatables in innovative and creative ways or ordering new inflatables to add to your fleet. This newsletter can help with the former. Landmark Creations can help with the latter. Contact us today for details. In addition to today's issue, we have two exciting releases for you to look forward to in the fall issue of Landmarketing. Anybody who was able to get one of our prized 2006 Landmark calendars will be excited to know there's a 2007 version in the works. Yes, you'll get more Landmarks On Location inflatable marketing ideas and also more fun between our lovable mascots. Never had a Landmark calendar? You've been missing out! Stay tuned and I'll keep you posted on when and how to get yours. Last - but far from least - it's time to start pumping up your mouse-clicking finger. You'll want to be in shape for the new release of our next animated game. Dino and our creative engineers are at it again and there's no telling what they'll come up with. The suspense is killing me! In a six-page spread in the June 2006 issue of Sign Builder magazine, Landmark President, Tom Meacham got some excellent coverage while discussing creative inflatables. Outlining some of Landmark's most challenging projects, Tom talked about the Heisman Trophy, interactive inflatables. He also gave excellent advice to those trying to break into the inflatables rental business: be creative - don't follow the crowd. There are two birthdays coming up in August. Baby Calvin (our son) is turning one and Landmark Creations will be 20! Both are cause for dancing in the streets and both bring about an unexplainable urge to reminisce. Enjoy this issue and I'll see you again in the fall. Summer is usually a lazy time when school is out, things slow down and families take vacations. But this summer has been a tremendously busy one for us here at Landmark Creations. Now that fall has arrived, we've got exciting news on several fronts. New Brochure - We've updated our brochure with new projects and information. We'd be delighted to send you one. Simply request it online and we'll get it right out. 2008 Discover Great Landmarks Calendar - We're getting closer by the day to finishing the new 2008 calendars. Be the first in your office to have one! Pre-order today and we'll ship yours hot off the presses. New Landmark Creations Website - After countless hours of personal toiling and sacrifice, I'm proud and pleased (and relieved!) to announce the publication of our new website! An updated design accompanied by easier-to-use functionality and expanded information will mean a better experience for you. Whew! That's a lot as it is, but there's still more. I've got case studies for you and a new free guide to help you effectively buy and use inflatables. Goldy the gopher was jumping for joy the day the University of Minnesota decided inflatable sports tunnels would be added to their lineup. No doubt, Goldy already knew how valuable inflatables are when it comes to building excitement and increasing fan support. That's one smart gopher! The Waubonsie Valley Warriors are serious about football! So are their fans. So when they had the opportunity to buy custom inflatable tunnels they were excited. Sports inflatables offer some unique features other products don't. Custom designed, inflatable tunnels can take any shape and color you want. Naturally, the Warriors wanted something with an Indian motif. They decided on a headdress adorned in school colors. Want an easy reference guide for buying and using inflatables effectively? 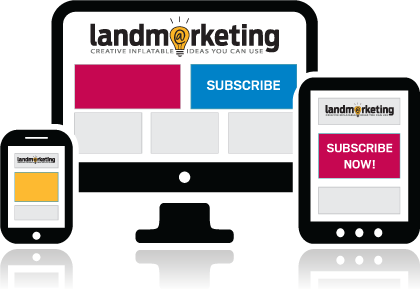 We've recently taken a "best of" selection of past LandMarketing articles and compiled them into a convenient users guide. Complete with questions to ask, checklists and charts, this manual is a quick-read you can print and keep on hand for future inflatables purchases. Download your free copy today! Are you still writing 2006 on your checks? Yeah, me, too! Hopefully, looking at your new 2007 Discover Great Landmarks calendar will help you make the transition to 2007 more easily. What? You didn’t get a calendar? Well, I can take care of that! If you want a Landmark calendar or you need additional copies just email me and I’ll get them right out to you. In this issue you’ll find three interesting inflatables case studies. Learn how the Eagan Fire Department will get a break from the blaze, the Army National Guard got racy during recruiting and the Chicago Bears broke out onto the field in style. Can You Help Save New York? Our two international travelers, Rex and Buddy, are on their way to La Guardia Airport... and couldn't resist a little one-on-one combat. Buddy's got his biplane all gassed up and there's a special guest appearance of the 'evil' goat if you're quick enough to make it past the first level. See if you have the skill to maneuver Dino through all the action. You can tell your boss it helps get your creative juices flowing and improves your hand-to-eye coordination. You'll have a blast! Enter To Win A Free Apple iPod Shuffle ($79 Value!) We want to make Landmarketing an even more valuable resource for you in 2007. In order to give you what you want you’ll first have to tell us what that is! If you’ve got five-minutes to tell us what you think, we’ll offer you the chance to win an Apple iPod Shuffle valued at $79! Just answer five quick questions (most are multiple choice) letting us know what changes you’d like to see made to Landmarketing. It’s that simple! Click over to the survey today to participate! Be sure to provide your name and email address in the last field so we can notify you if you’re the winner. Drawing to be held Feb 28, 2007. Firefighters have one of the most stressful and dangerous jobs on earth. In constant fear for their lives, firefighters desperately need a place to take a break, recoup and rejuvenate during the course of putting out a blaze. Until now, there were no portable, mobile shelters. To date, firefighters depend on old school buses (or similar vehicles) to serve as their rehab stations: Not very comfortable or roomy. others. Learn more about our portable shelters. When the Army National Guard wanted to increase exposure, they turned to Landmark Creations. Taking a message of leadership, education and service to our country before schools, sporting event attendees, and parade and fair goers, the Guard really needed a way to stand out. With custom tents, their presence is well known. "I Want To Be An Inflatables Dealer!" It certainly is flattering! Anytime we get requests from businesses that want to distribute our products we take it as a testimony to the quality and service we provide. That’s what makes it difficult to explain that we don’t have dealers - exclusive, territorial or otherwise. Since the advent of the Internet, it’s nearly an impossible feat. We do, however offer distributorships for those who are interested. This allows you to get the quality, custom and stock shapes you need at a discount in order to resell them to your customers. When last we met, Landmark was embarking on a company-wide expansion. I'm glad to say it has been completed. We've doubled our warehouse space and now have an increased capacity to produce larger orders with lightning fast speed! Of course, at Landmark it's all about quality (well, quality and having fun) so we've taken every precaution to keep or even exceed the exceptionally high design and production standards we've always had. If you're in the neighborhood, drop by and say, "Hi!" We'd love to show you around. In this issue of Landmarketing, I'll bravely take on the subject of zoning and permits in our feature article. Plus I also have some more great case studies to help spark your creativity. So let's get to it! The long-time mascot of Fowler Chevrolet, Jed the Bloodhound came to life at the hands of Landmark Creations' expert artists. Jed had previously lived only in the pages of print ads until his likeness was recreated in inflatable form. Fowler Chevy was very excited. "He looks amazing. Thank you so much for your wonderful product!" It's homecoming, Little League style! This mighty bee looked mighty fine representing the Holly Springs little league football team who plays as part of a community youth league. As they set up the track for homecoming (complete with youth cheerleaders and a convertible car parade) the team was able to burst onto the field through their new inflatable tunnel (compliments of an anonymous donor). Valero Convenience stores sponsors a golf tournament each year in San Antonio, Texas. While signage and other advertising they received as a sponsor were great, Valero wanted to draw some real attention to its convenience store products and corporate brand. Landmark did them proud! Inflatable tunnels aren't just for football. This college basketball team needed a way to close off the area of the gym where players exit the locker room. So, in addition to building excitement for the players and fans, this tunnel also has a functional purpose.